Our technicians are highly trained and go through an extensive background check and certified by Crimshield. We work hard to hire only those who find fulfillment in doing the job right the first time. At Tacit Services, we have found that when technicians are given enough time to do their jobs and are rewarded for high quality work, they will put more effort into providing the premium service we expect. 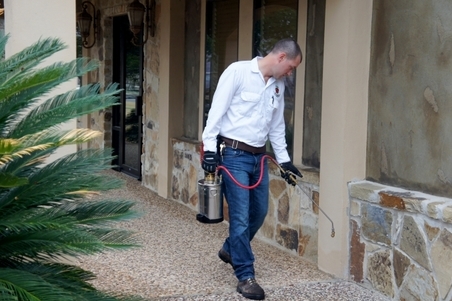 ​We provide a customized, thorough inspection and application of our pest control products. each home, using inspection and control techniques to target various common pests. Our technicians will apply products to areas in which pests nest and breed to reduce and control the population in and around your home. Controlling pests includes more than simply treating. Effective control also comes from reducing common nesting areas around a home and sealing cracks to reduce entry points. These measures along with others are part of Tacit Services Integrated Pest Management solutions that include customized recommendations to guide you through pest-proofing your home and understanding the most realistic time frame in which to achieve acceptable long-term control. Product labels allow for varying mixing levels to control a variety of common pests. All of our products are mixed at the proper, EPA-approved levels and are applied correctly per the manufacturer’s instructions to ensure pet and human safety, while still achieving maximum effectiveness in reducing pest populations. We also offer green, organic pest control treatment plans. ​All Tacit Services services are fully guaranteed. If you are still seeing an occasional live pest scurrying around the house in between regularly scheduled services, call us. We’ll come back and provide additional interior or exterior service—free of charge. We are strongly committed to providing a broad range of services with the quality and reliability our customers demand. Our aim is to use the most effective and efficient techniques and materials, while keeping a watchful eye on the safety of our clients, our team and the environment. As our name implies, we hold high the value of implicit responsibilities and commitments in every relationship, and we firmly believe in the value of faith in one’s word and trust in a firm handshake. In 1995, Tacit Services began operations founded on the concept of providing guaranteed, effective treatment, while maintaining the highest standards of customer service.